Three years' worth of readings from the European Space Agency's CryoSat 2 satellite indicate that Antarctica's ice sheets are losing 159 billion tons of ice per year — which is twice as much as the estimates from previous altimeter surveys. The latest estimates, published in Geophysical Research Letters, are in line with estimates produced by other methods. They're also consistent with last week's reports that the West Antarctic Ice Sheet is in the midst of an apparently unstoppable retreat. "We find that ice losses continue to be most pronounced along the fast-flowing ice streams of the Amundsen Sea sector, with thinning rates of between 4 and 8 meters per year near to the grounding lines of the Pine Island, Thwaites and Smith Glaciers," the University of Leeds' Malcolm McMillan, lead author of the study, said in a news release. The grounding line is the boundary where glaciers lift off an underlying land mass and start floating out to sea. The University of Washington's Ian Joughin, a lead author of one of last week's studies, said the CryoSat 2 survey did a "nice job of revealing the strong thinning along the Amundsen Coast." 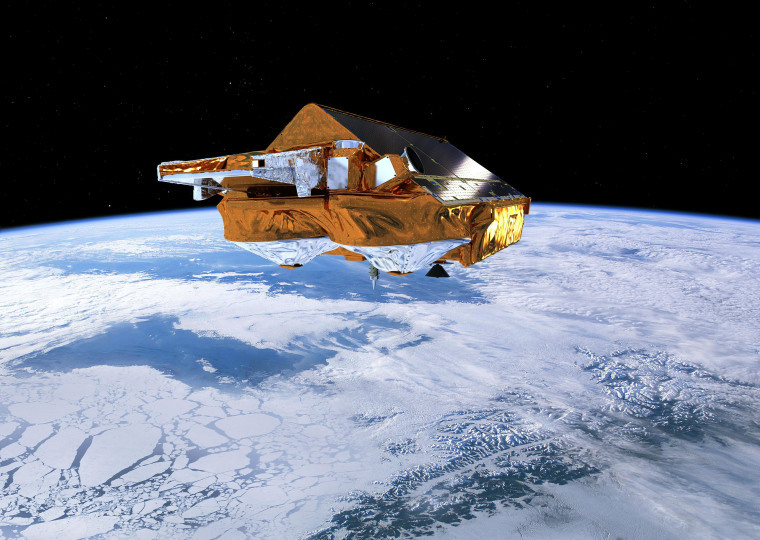 Previous surveys were unable to estimate ice loss with as much accuracy as CryoSat 2 can. The latest figures show that West Antarctica lost about 134 billion metric tons of ice annually between 2010 and 2013. The estimated annual loss was 3 billion tons for East Antarctica, and 23 billion tons for the Antarctic Peninsula. The figures add up to a total of 159 billion tons when rounding is taken into account — but the margin of error is still relatively high, at plus or minus 48 billion tons. The researchers say the estimated ice loss is enough to raise sea levels by 0.45 millimeters per year. That's less than two-hundredths of an inch, but Joughin and other climate scientists say their models show the Antarctic ice loss rate accelerating dramatically over the centuries to come. In the Northern Hemisphere, the Greenland Ice Sheet is also expected to make a significant contribution to rising seas. A study published Sunday by Nature Geoscience reports that the canyons beneath the Greenland Ice Sheet are deeper and longer than previously thought. That suggests that there's more ice on the northern land mass available for thawing in a warming world, with the result that Greenland's future contribution to sea level rise could exceed past estimates. "The glaciers of Greenland are likely to retreat faster and farther inland than anticipated, and for much longer, according to this very different topography we have discovered," lead author Mathieu Morlighem of the University of California at Irvine said in a NASA news release. The new estimates were developed using multiple surveying techniques — including ice thickness readings from airborne radar instruments, satellite radar observations of ice flow speed and direction, and estimates of snowfall and surface melt to the sea. The radar-surveying satellites employed for the study included Canada's Radarsat 1, Japan's ALOS, Germany's TerraSAR-X and ESA's Envisat. The project also drew upon data from NASA's Airborne Topographic Mapper, ICESat and Operation IceBridge aerial survey. "We have been able to make a quantum leap in our knowledge of bed topography beneath ice sheets in the last decade, thanks to the advent of missions like NASA's Operation IceBridge in combination with satellite data on the speed these ice sheets are flowing," said Eric Rignot, a researcher at UC-Irvine as well as NASA's Jet Propulsion Laboratory. Rignot was the lead author of last week's other study about the West Antarctic Ice Sheet's retreat. He said the studies relating to Antarctica in the south and Greenland in the north "illustrate clearly the globe's ice sheets will contribute far more to sea level rise than current projections show." Correction for 12:10 p.m. ET June 23, 2014: A photo accompanying a previous version of this report showed an outlet glacier from the Penny Ice Cap on Canada's Baffin Island, rather than a Greenland glacier. In addition to McMillan, the authors of "Increased Ice Losses From Antarctica Detected by CryoSat-2" include Andrew Shepherd, Aud Sundai, Kate Briggs, Alan Muir, Andrew Ridout, Anna Hogg and Duncan Wingham. In addition to Morlighem and Rignot, the authors of "Deeply Incised Submarine Glacial Valleys Beneath the Greenland Ice Sheet" include Jeremie Mouginot, Helene Seroussi and Eric Larour.